Abcam’s CA125 (MUC16) in vitro SimpleStep ELISA® (Enzyme-Linked Immunosorbent Assay) kit is designed for the quantitative measurement of Human serum, plasma, cell culture supernatants, urine, milk, and saliva samples. Cancer antigen 125 (CA125, also known as Mucin 16) is a membrane associated cell surface protein containing approximately 22,096 amino acids. CA125 is the largest member of the Mucin family of proteins and is highly o-glycosylated. The hydrophilic nature of mucin proteins gives them the ability to form protective/lubricating gel-like barriers to protect against chemotherapy agents, foreign particles and infectious agents. 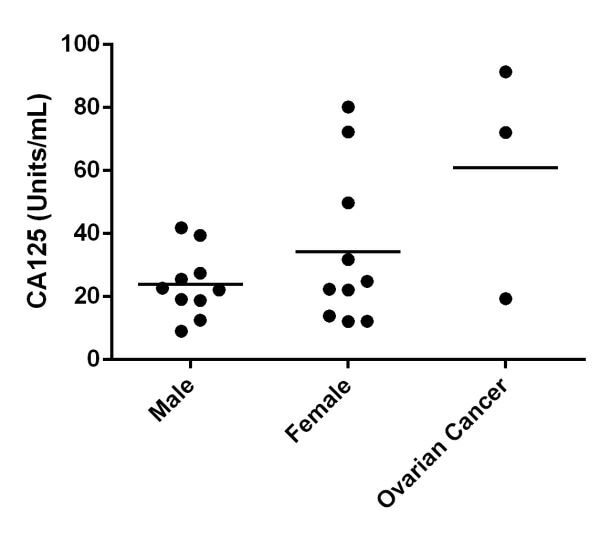 CA125 is used as a biomarker for ovarian cancer detection, with about 90% of women with advanced ovarian cancer having elevated levels of CA125 present in their blood serum. Thought to provide a protective, lubricating barrier against particles and infectious agents at mucosal surfaces. Expressed in corneal and conjunctival epithelia (at protein level). Overexpressed in ovarian carcinomas and ovarian low malignant potential (LMP) tumors as compared to the expression in normal ovarian tissue and ovarian adenomas. Composed of three domains, a Ser-, Thr-rich N-terminal domain, a repeated domain containing more than 60 partially conserved tandem repeats of 156 amino acids each (AAs 12061-21862) and a C-terminal transmembrane contain domain with a short cytoplasmic tail. Heavily O-glycosylated; expresses both type 1 and type 2 core glycans. Heavily N-glycosylated; expresses primarily high mannose and complex bisecting type N-linked glycans. May be phosphorylated. Phosphorylation of the intracellular C-terminal domain may induce proteolytic cleavage and the liberation of the extracellular domain into the extracellular space. May contain numerous disulfide bridges. Association of several molecules of the secreted form may occur through interchain disulfide bridges providing an extraordinarily large gel-like matrix in the extracellular space or in the lumen of secretory ducts. Cell membrane. Secreted > extracellular space. May be liberated into the extracellular space following the phosphorylation of the intracellular C-terminus which induces the proteolytic cleavage and liberation of the extracellular domain. Our Abpromise guarantee covers the use of ab195213 in the following tested applications. 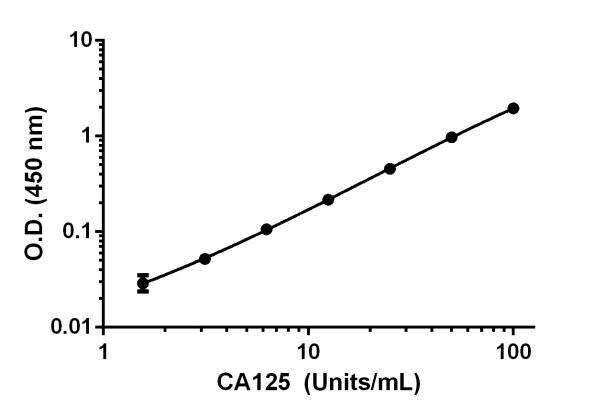 Example of CA125 standard curve prepared in Sample Diluent 25BS. Titration of cell culture supernatants across different cell lines. Non-background subtracted data from duplicate measurements are plotted. 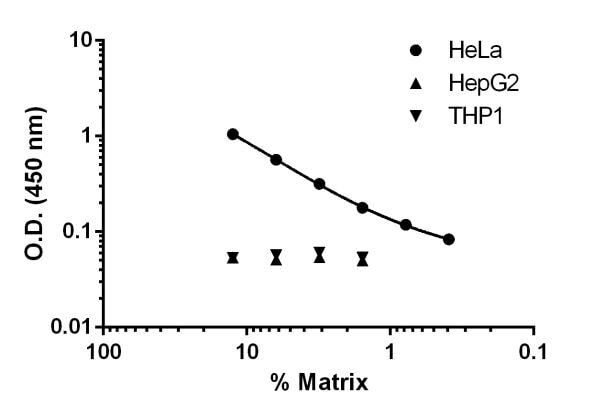 CA125 was detectable in HeLa cells culture supernatants (4-days culture), HepG2 and THP1 cell culture supernatants (4-days culture) were loaded as negative controls. Titration of individual normal male, female, and 3 patients diagnosed with ovarian cancer. Duplicate interpolated values of CA125 (mean +/- SD, n = 2) are graphed. Medical histories of individual donors was not known. Measurements of CA125 are known to fluctuate in individual serums due to onset of certain cancers and benign conditions, thus CA125 elevation alone is not reason enough for diagnosis. Publishing research using ab195213? Please let us know so that we can cite the reference in this datasheet. There are currently no Customer reviews or Questions for ab195213.